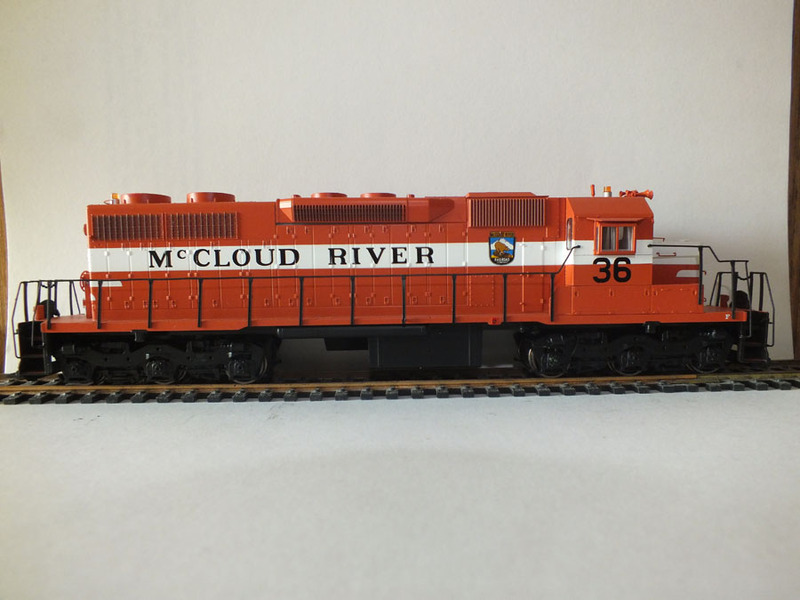 Eleven years ago Athearn released models of the McCloud River SD38s in the original orange and white paint. 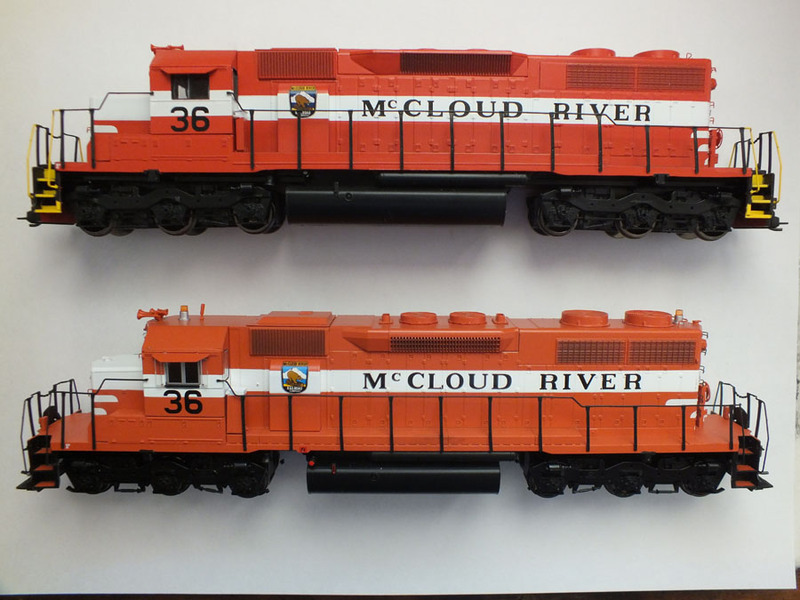 Athearn announced a second run of these models in July 2017, and they arrived on store shelves in late July 2018. I picked up my ordered set from a hobby shop in early August. First off, my initial impressions are that these models are significantly better than the first run. They have many additional detail parts above and beyond the first run, including all weather windows applied to the engineer side, air deflectors on the conductor side windows, drop steps, radio antennas, flasher beacons, better detailed air horns, and the correct smaller 3,200 gallon fuel tanks. 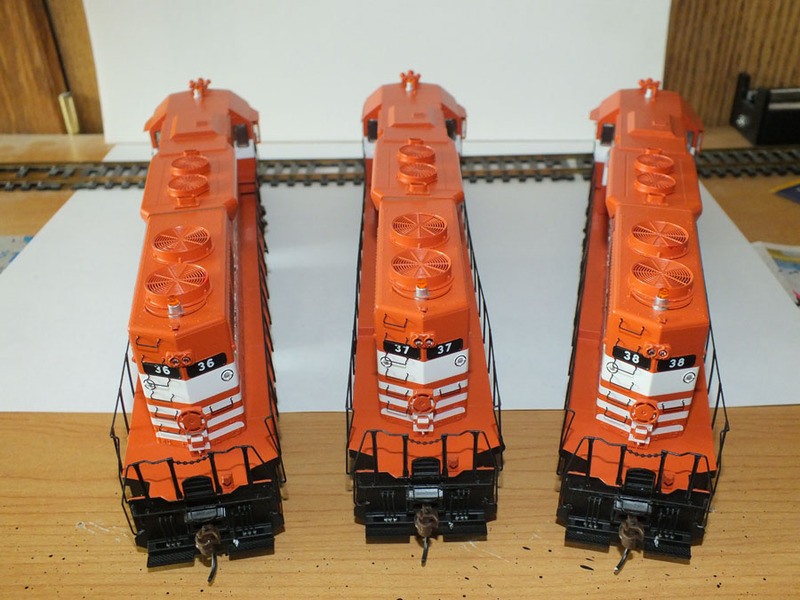 They orange used on the models is not quite as red as the first run, which appears to capture the fading the paint jobs had in their service life. 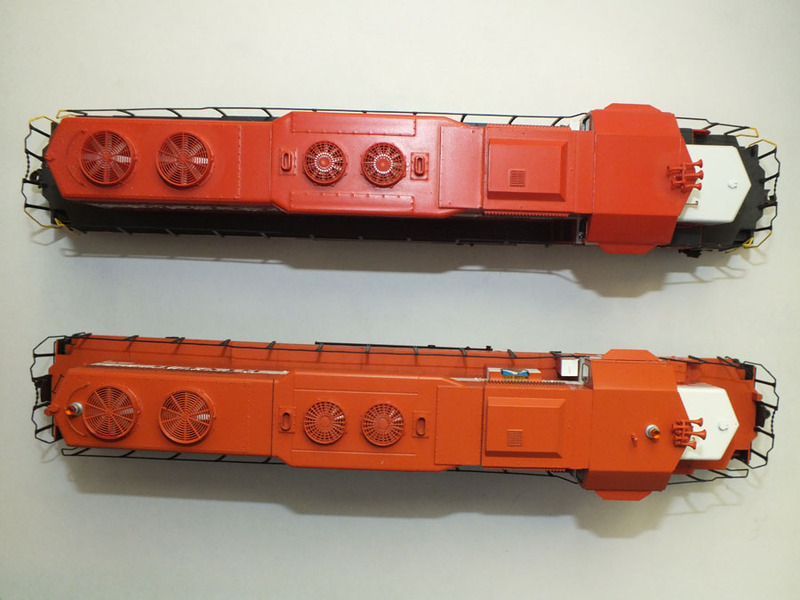 One of the most noteable differences between the two runs is Athearn painted the walkways the correct orange instead of the black used on the first run. Here are a few side by side comparison pictures of the #36 from the two runs showing some of the differences and improvements. The first run is at the top, the second run at the bottom. The other side of the two runs, once again the first run above and the second run below. Top view of models from the two runs. Head on view of the two runs, first run on the left, second run on the right, again showing improvements and upgrades between the two runs. 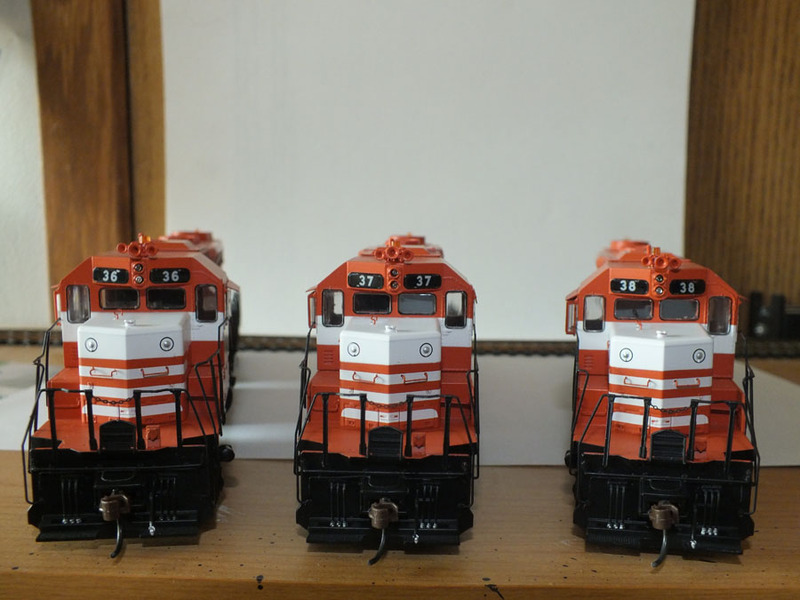 Head on view of all three SD38s offered in this run. 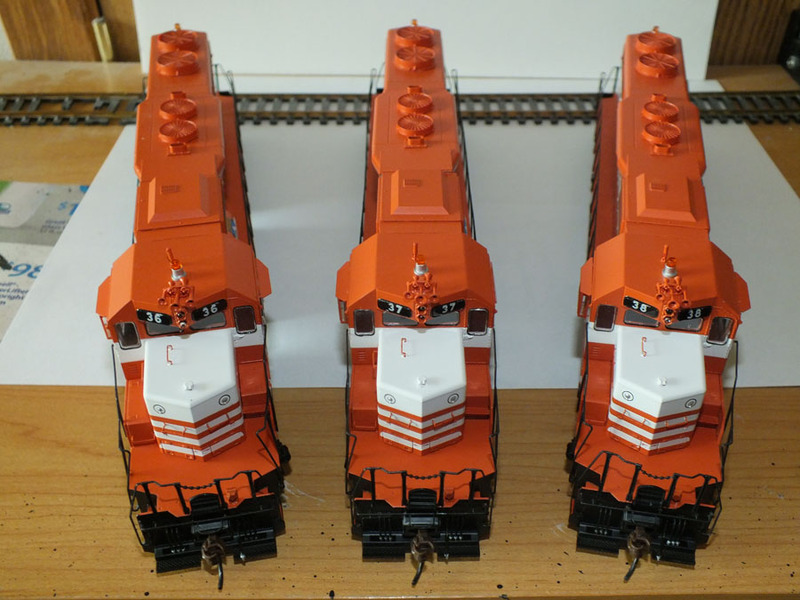 Aeiral front view of the three models. Rear view of the three units of the second run. One of the selling points Athearn indicated on this run is that the fuel tank could be removed to expose the cast motor block, which would approximate the units appearance with the small fuel tanks from their 1969 delivery up until the railroad installed the larger tanks (1978 on the #38, December 1981 for the other two). Here are two shots of the prototype #36 showing the original small fuel tank and then how it compares to the model with the fuel tank removed. These models do have a few slight drawbacks. As with the earlier runs, the fuel tanks are mounted slightly too far forward on the frame to be "correct". This is also true of the smaller fuel tanks, though allowances have to be made given that the "fuel tank" is the block into which the motor is anchored. There was some slight factory flaw in the painting process that caused the lettering on the right side of all the models to be incompletely applied over the shell details, resulting in slits of white appearing in a few of the black letters. Perhaps the biggest vusual incorrection on the models is the orange paint applied to the steps, these should have been either all black or with the yellow safety accents on the steps and handrails as featured on the first run. 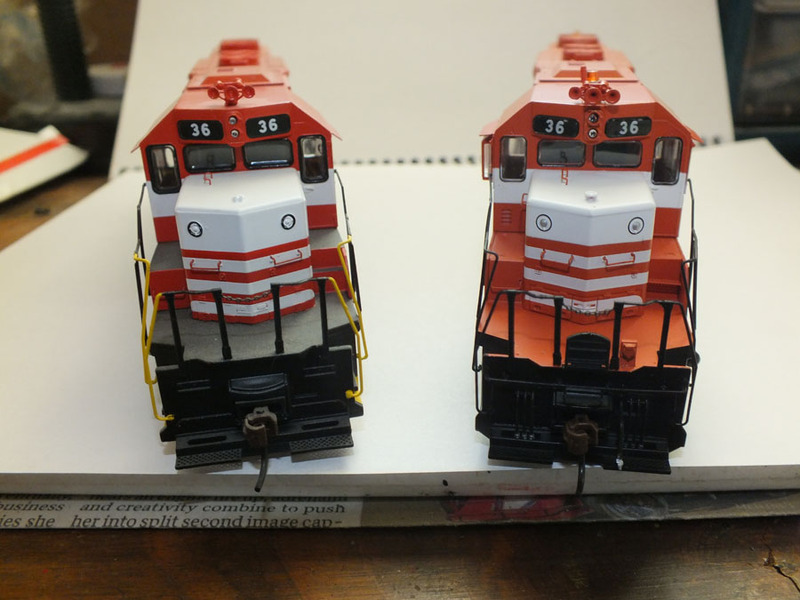 The models are available in both DC and DCC with sound versions; the flasher beacons on the DCC units light up, but out of the box they are incorrectly configured, with the rear flasher either off or on all the time. This last problem is fairly easily corrected with a bit of programming. On the whole, however, these are very nice models and are welcome additions to the modeling world. I highly recommend them. 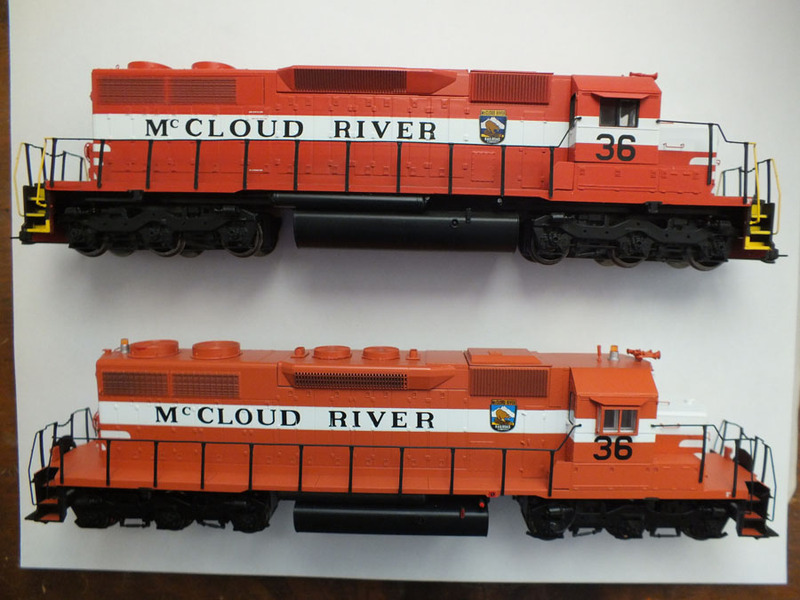 Athearn has announced they will be offering their wide vision caboose painted as McCloud River #101 and McCloud Railway #102, both due out in February 2019, followed in May by another release of several numbers of McCloud River incentive per diem boxcars. 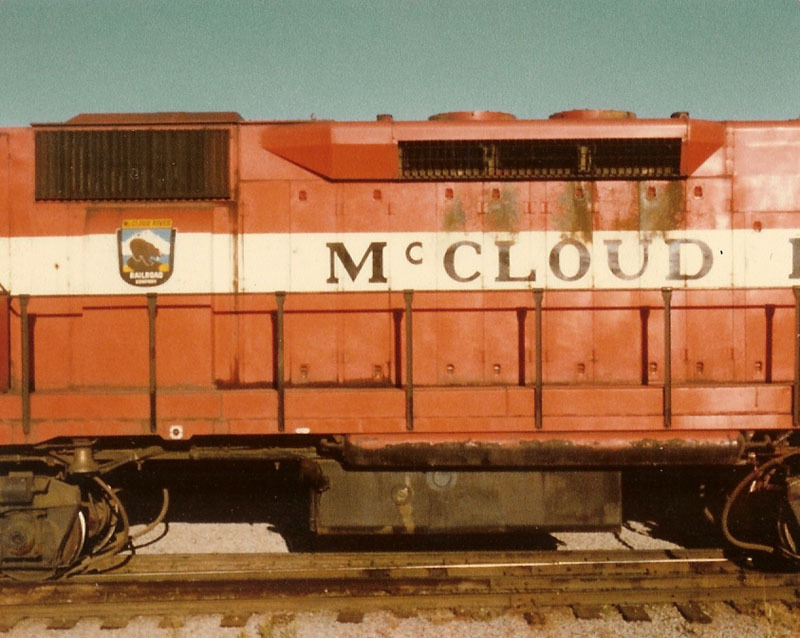 Athearn has indicated they may offer a second run of the brown and orange paint scheme in the future, along with the McCloud Railway red and silver. I hope they do.